Prime Minister, the Most Hon. Dr. Hubert Minnis says the Smith’s Point Project is part of a broader vision and program for the revitalization and renewal of Grand Bahama. During the official opening of the newly constructed sea wall in Smith’s Point, Prime Minister Minnis, who was the keynote speaker, noted that his government is committed to investing in sound infrastructure which supports economic growth and which fosters efficiency and normalcy in the day-to day-lives of Bahamians, while protecting the country’s natural and built environment. “After many, decades of struggle, neglect, and fits and starts, the Grand Bahama revival has begun,” added Dr. Minnis. The Prime Minister pointed out how the historic community of Smith’s Point, where the first “Fish Fry” in Freeport began, has experienced progressive erosion along its entire southern shoreline for many years, adding that hurricane and storm activity have resulted in considerable amounts of sand and water being washed into the roads, causing dangerous driving conditions and an unsafe and unsanitary environment for residents and visitors. He pointed out that in 2015, it was decided that a seawall would be built along the shoreline as a preventive measure to mitigate against these conditions. In April 2016, a tender exercise was undertaken with four construction companies invited to tender for the works. The contract was awarded to Smith Construction Limited. However, by early May, 2017, the contract was only thirty three per cent completed. “In order to protect the community’s and the Government’s interests, the Ministry of Public Works decided to terminate the contract with immediate effect,” said Prime Minister Minnis. “On the 8th of June 2017, a letter of termination was served. The contract termination created a sense of urgency to complete the works due to the imminent onset of the hurricane season. “Waugh Construction (Bahamas) Limited, a local company, was a part of the original tender exercise. It possessed the logistical expertise to facilitate the project, and was subsequently contracted. Waugh’s assignment to the project resulted in a further 200 feet added to the eastern end of the original 1700-foot length reinforced concrete; bringing the total length to approximately 1900 feet. The Prime Minister noted that during the construction of the seawall, also taken into account was the need for the realignment at the eastern end to allow for parking for visitors to the beach area. He added that safety issues were also addressed, inclusive of a ramp for people with disabilities at the western area, and additional steps for ease of access by the public. “The design of the seawall should lessen the vulnerability of hurricanes in this community,” said Prime Minister Minnis. “Sea-surges, flooding, structural and other water-based damage have proven to be commonplace in this area. “This seawall has passed the two litmus tests of its structural integrity and sustainability having gone through Hurricanes Matthew and Irma during the construction period. “The project has also created business and employment opportunities. Construction workers and owners of construction businesses and suppliers have benefited from this project. The Prime Minister acknowledged a number of key individuals, who have been instrumental in the fruition of the project, including Deputy Prime Minister and Member of Parliament for East End (the constituency in which Smith’s Point is located); Minister of Works, Hon. Desmond Bannister; Leader of the Opposition and former Minister of Public Works, Philip Brave Davis; former Minister for Grand Bahama, Dr. Michael Darville, along with Government officials in Grand Bahama and residents of Smith’s Point. “I thank all of those involved in this project,” said Prime Minister Minnis. “I pray God’s blessings on all of you and on the residents of Smith’s Point and Grand Bahama. 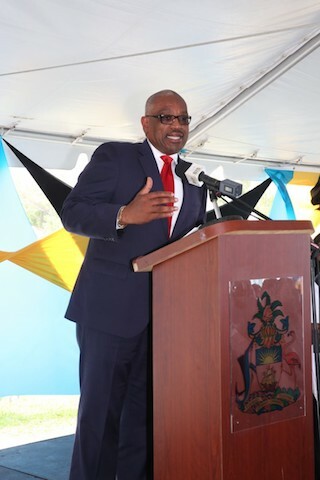 KEYNOTE SPEAKER – Prime Minister, the Most honorable Dr. Hubert A. Minnis was the keynote speaker during the official opening ceremonies for the Smith’s Point Seawall, on Friday, April 5, 2019. 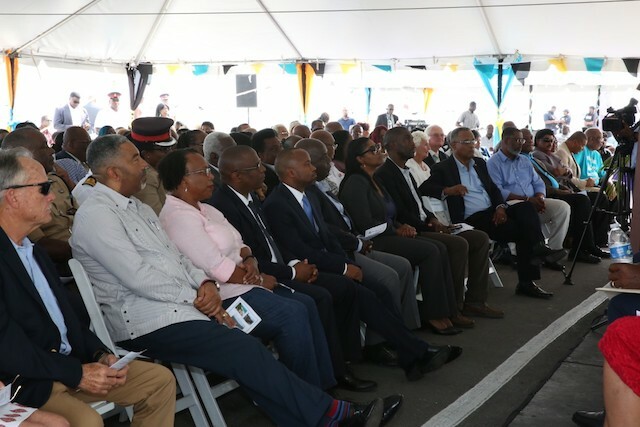 AT THE OPENING – A number of government officials and dignatiries were on hand for the opening ceremonies of the Smith’s Point Seawall in Freeport, Grand Bahama on Friday, April 5, 2019. In the audience during the ceremony were Minister of Social Services, Hon. Frankie Campbell (second from left); Minister of Agriculture and Marine Resources, Hon. Michael Pintard (fourth from left); Minister of State for Grand Bahama, Senator Kwasi Thompson (fifth from left); Opposition Leader, Philip Brave Davis (sixth from left); Parliamentary Secrtary in the Office of the Prime Minister, Pakesia Parker-Edgecombe and former Minister for Grand Bahama, Dr. Michael Darville (ninth from left). 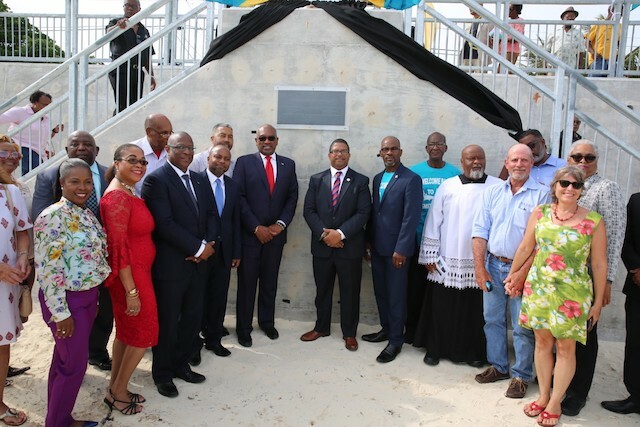 SEAWALL OFFICIALLY OPENED – Prime Minister of the Bahamas, the Most Honorable Dr. Hubert Minnis and Deputy Prime Minister, Hon. Peter Turnquest, are flanked by a number of government officials, dignitaries, government workers and contractors, as they unveiled the plaque on a part of the new seawall in Smith’s Point, during opening ceremonies for the wall on Friday, April 5, 2019.